We are a full service catering and event planning company. 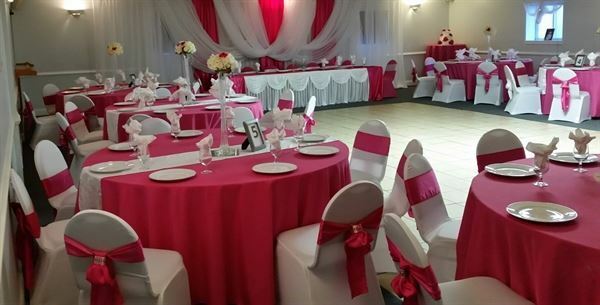 We host all types of social gatherings to include wedding receptions, birthday parties, retirement parties, baby showers and corporate gatherings. We provide on-site and off-site catering and our facility can accommodate up to 100 people seated. We are able to work with all budgets. Party venue that includes all tables, chairs and room for up to 100 people. $200 non refundable deposit is due at contract signing. Balance is due 8 weeks before event date or date can be forfeited. Our rental rates start at $450.00 for 4 hours of fun for our smaller space. Adult Birthday Party Package includes the venue, all tables and chairs for 4 hours of fun. Pay as you go bar. Price includes 4 hours for your day party and 1 hour for setup. Tables and chairs for up to 100 people included. Includes cash bar. No weapons or drugs allowed on the premises. $150 venue fee is required in addition to the party package fee. Refundable if venue is cleaned as per contract and party ends on time. Our venue only deal starts at $900 and includes 6 hours for your event. Tables and chairs for up to 90 people are included at no extra charge. Deposits are nonrefundable. Full contract amount must be paid within 8 weeks of the event. This was a cool little space to have our crab feast . .. not too big and not too small. Everyone had a good time. We had our 20 year class reunion at this place. It was very nice. The staff was professional and went out of their way to make sure we all had a very time. The bartender was great! This place is really affordable. Riverside on the Potomac, a beautiful venue for weddings and special events along the Potomac River in Loudoun County, Virginia, offers sweeping views of manicured lawns, seasonal gardens, ponds, Sugarloaf Mountain and the Potomac River. The patios and Waterfall Terrace are perfectly appointed for cocktail hours and friendly conversations. The sounds of the waterfall and reflections in the pond set the mood for a lovely time in the Virginia countryside. Woods along the river, gardens, and native trees throughout the property offer a gorgeous backdrop; lush with green health in Spring and Summer and warm with transitional color in Autumn. Brides and party hosts will feel supported and relaxed as they plan their event at Riverside on the Potomac which has been carefully designed to accommodate all of their needs. Riverside on the Potomac is also a working farm with horses in three rail equestrian fenced paddocks overlooking the hay fields and polo grounds. The polo grounds make a great site for large corporate events.